The 1PG line gets the sword & sorcery treatment with this beer & pretzels fantasy game from Jeff Mejia and James Stubbs. Following the tropes of cheesy barbarian movies of the 1970s and 1980s, Broadswordis the most burly and robust 1PG yet! Powered by Todd Downing's 1PG system, this game is so simple you can play it with a beer buzz, a head wound*, or BOTH! As always, the 1PG is easy to learn, quick to play and fully disposable. * Deep7 in no way endorses playing RPGs with a head wound - please seek medical assistance. 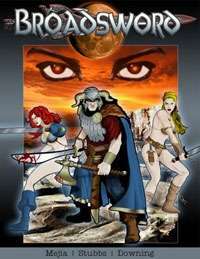 Does anyone know if you can still buy the World of Broadsword expansion book? I do see there are other campaign books. This title was added to our catalog on May 31, 2007.